"Ghost" redirects here. For other uses, see Ghost (disambiguation). These tormented souls of slain mice seek vengeance upon the hunters who cursed them to the grave. No Charms are required to attract the Ghost Mouse. The Ghost Mouse drops Stale Cheese in the Catacombs location. The Ghost Mouse will drop Ectoplasmic Essence in the Mousoleum location when working the Zurreal Trap Research Assignment. Three Ectoplasmic Essences are necessary for crafting the Zurreal's Folly weapon. The Ghost Mouse is not known to drop any other loot in the Mousoleum or Forbidden Grove locations. Attraction info and special event loot drops for the Ghost Mouse can be found at the individual event location pages. The Ghost Mouse drops the Haunted Egg during the annual Spring Egg Hunt. 10 July 2008: The Ghost Mouse is released for the first time. 12 January 2011: The Ghost Mouse could be found at Ronza's Traveling Shoppe where it dropped Rockforth Cheese as loot. 14 April 2011: The Ghost Mouse began dropping the Green Plaid Egg as loot in the Catacombs as part of the Spring Egg Hunt 2011 event. 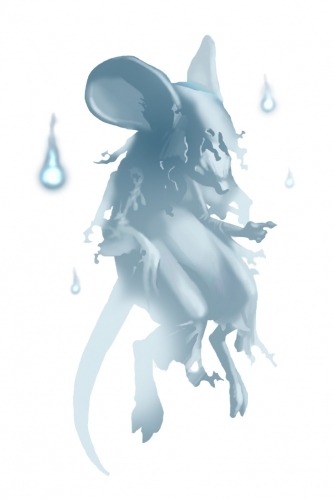 23 August 2011: The Ghost Mouse began to drop Ectoplasmic Essence as loot in the Mousoleum while hunters are in the process of completing the Zurreal Trap Research Assignment. 25 March 2013: The Ghost Mouse began dropping the Haunted Egg as part of the annual Spring Egg Hunt event.